SCULPTURE SET Great for carousel animal carving and sculpture! 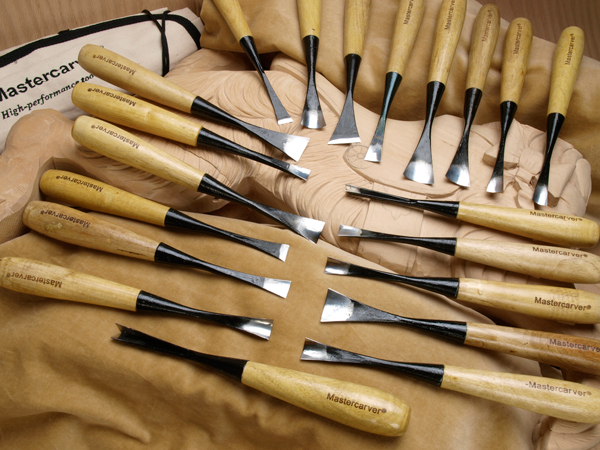 Mastercarver® Hand-Forged tools are used and recommended by leading professional wood carvers and teachers. These are fine quality tools at the lowest cost of any major brand. Hand forged from high carbon tool steel, (Rc 58-62). Use with mallet or hand push. Blades have low angles to slice wood easily. Sets typically contain the following 20-tools: #1-16mm, #1-25mm, #2-12mm, #3-25mm, #4-20mm, #4-30mm, #5-16mm, #5-25mm, #6-10mm, #6-30mm, #7-20mm, #8-12mm, #8-25mm, #9-10mm, #10-20mm, #11-10mm, #11-16mm, #28-16mm, #41-12mm, #49-10mm & heavy duty canvas cloth tool roll. Note: V-tools have a negative (reverse) rake for better cuts in cross and end grain. Features durable, socket style birch wood handles. Length 9.5″. Pre-sharpened (ready to carve). Did these need additional sharpening for best edge? The tool edges are sharp, highly polished and generally in “ready to carve condition”. However, although not generally necessary, it is standard practice to check all edges and lightly strop or touch up if desired. I bought this set about 3 years ago a long with the 13 piece set and have never been sorry! I love these tools and highly recommend them. Two years later and i still love these tools! And……………..All i have done to keep these tools razor sharp is to strop them on an old leather belt. If they feel like they need it, I use flexcut gold compound on the leather.